Looking for something fun to do with the family this September? 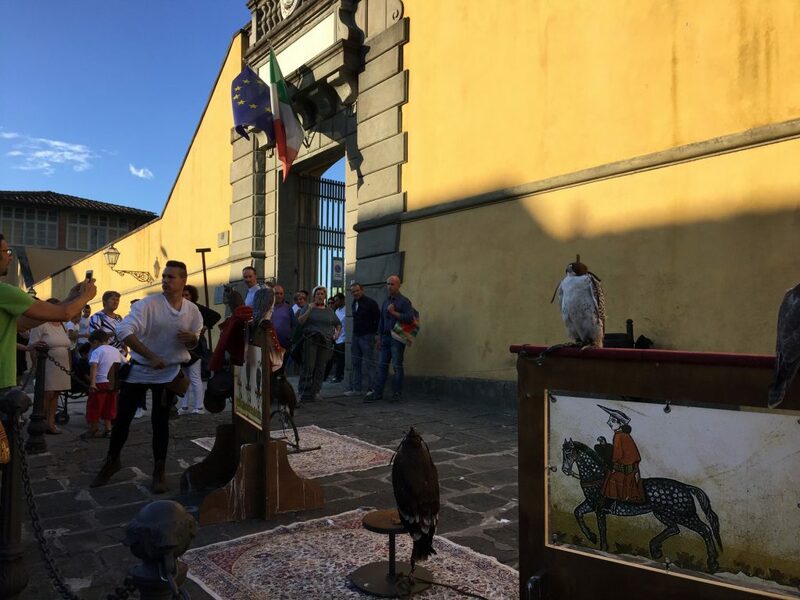 I’ve collected a list of 6 events to mark on your calendars to mix in to your visit to Florence to ensure you do something a bit different and fun than just visiting museums and other attractions. Listed in calendar order to make it easier for you to plan. The first two events take place the first weekend in September and both take you and the whole family back in time – you choose how far back! 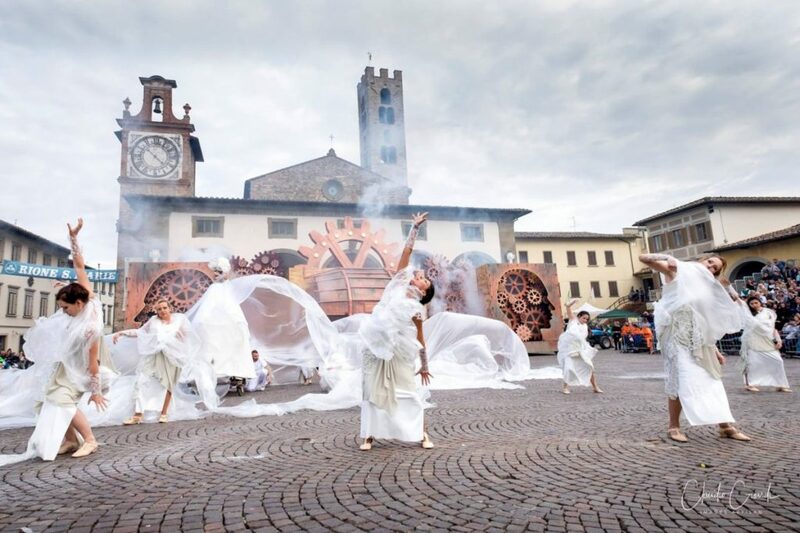 The first is the medieval fair, Salamarzana, which takes over the small town center of Fucecchio, just an hour west of Florence on the first weekend, September 1 and 2. Entrance is FREE! You can check out the complete program on www.salamarzana.it but in general you will find lots of shows, both musical and theatrical, itinerant performers, games and market stalls, all spread out across the streets, squares, courtyards and gardens of the town. 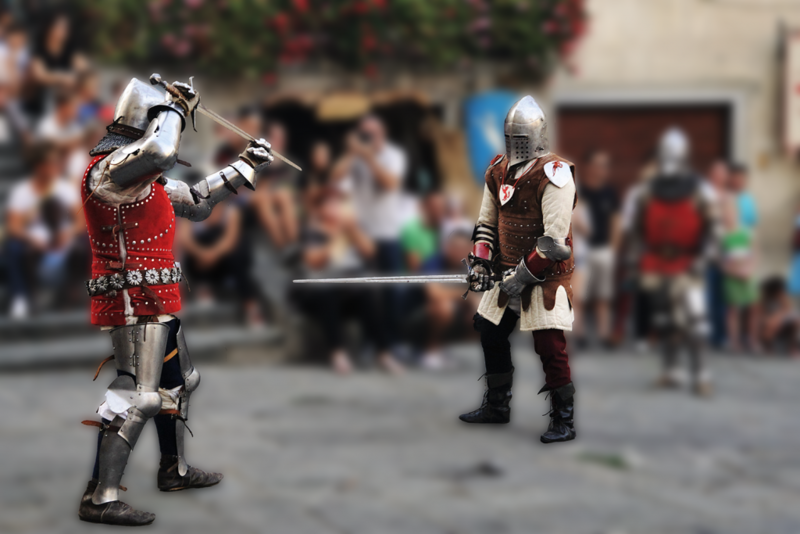 Military camps and jousting knights will draw you back to dangerous times, while the food stalls will offer delicious tasty morsels galore. Everyone dressed up in medieval costume to travel back in time together. 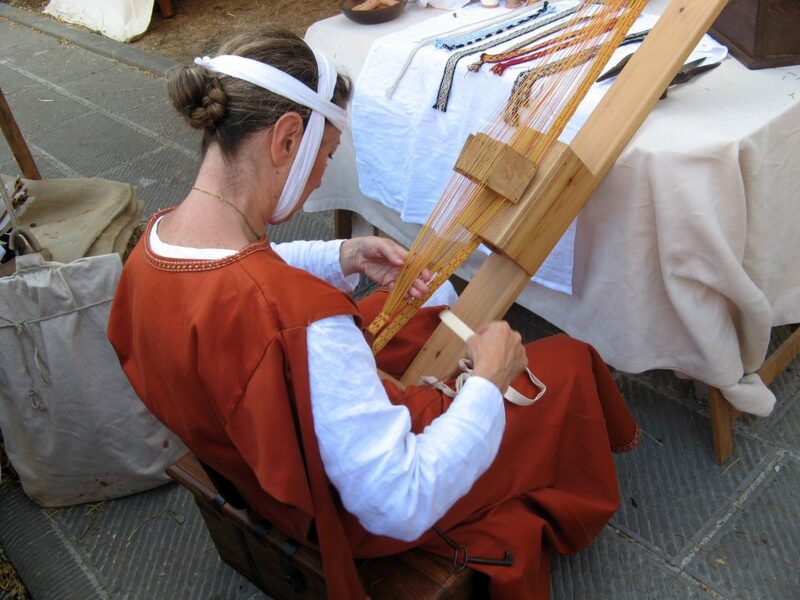 Taking place on the same weekend are the Renaissance Days in Scaperia, a small town about an hour north of Florence in the Mugello valley. 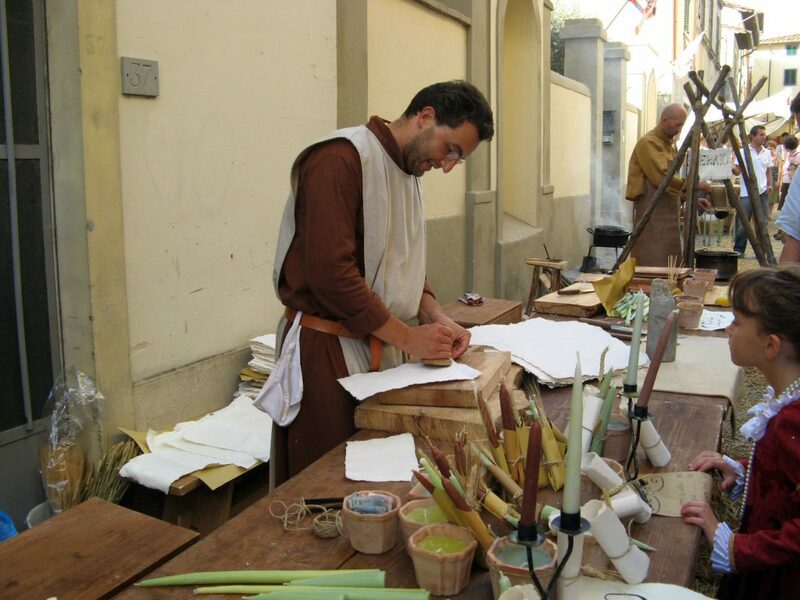 These days are part of a series of events held in town in September revolving around the Diotto – the 8th of September – which solemnly honors the occasion of when Scarperia was the local seat of power and held the Vicarage centuries ago. The entire town is transformed – straw covers the streets and stalls are set up to show the many different trades of long ago, which are a lot of fun to discover. Think paper maker, candle maker, blacksmith, book maker and more. Particularly important is the knife maker, which is what still makes Scarperia famous in the world today. We went several years ago to the Renaissance festival and truly enjoyed it. 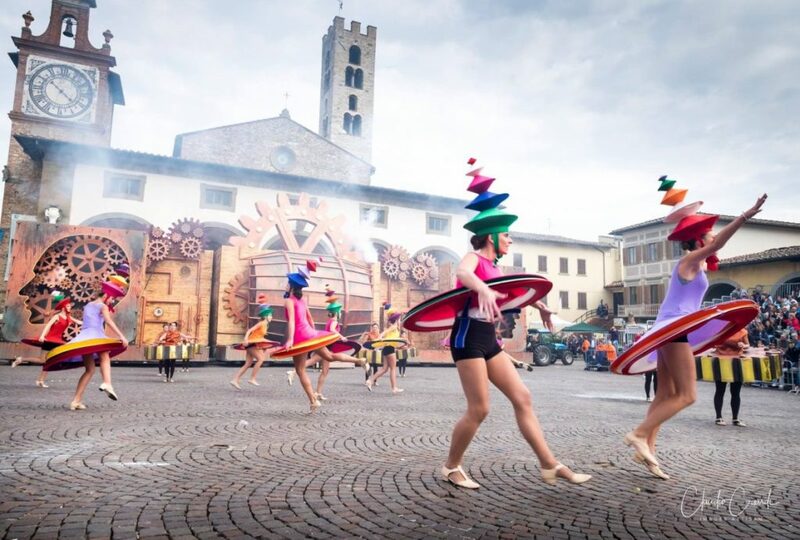 There are shows during the day, we see this year the Giullari del Diavolo will be performing and we highly recommend you make sure to attend one of those. 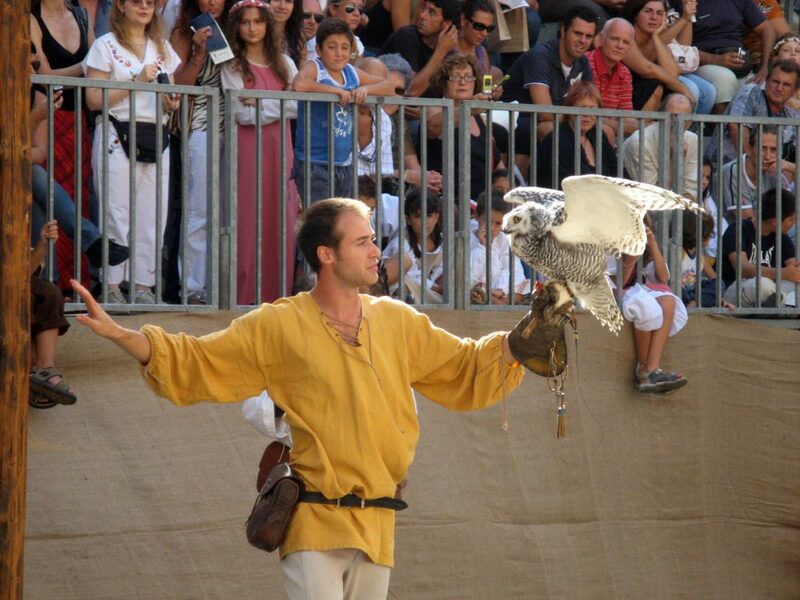 You’ll also find the military camps, the falconier demonstrate how birds of prey were trained and used for hunting. 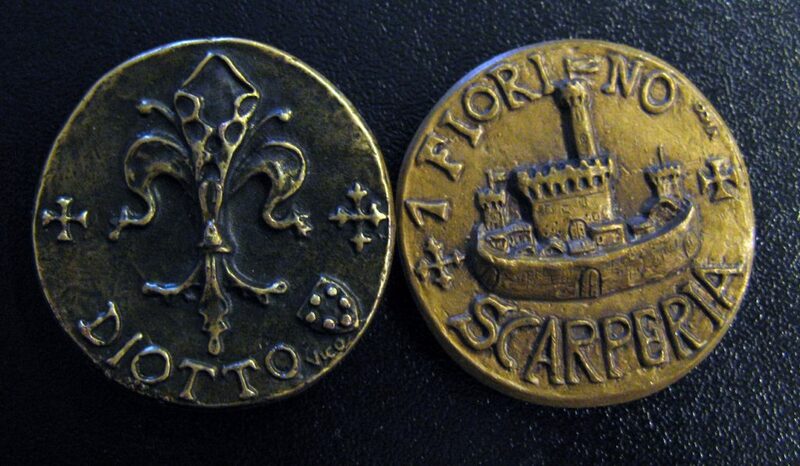 For all your purchases inside the Renaissance fair you’ll need to trade in your euros for the Fiorino! For the occasion, the inside the Palazzo dei Vicari are set up scenes of political life from the times with various “shows” during the day. For this you need to stop by and book a time to enter, since numbers inside are limited (cost 2 euro, includes visit to the entire palace and to the Knife museum). According to Christian tradition, on September 8 of an unknown year somewhere near Nazareth the Virgin Mary was born. In honor of this occasion, Florence and many small towns in the area “celebrate” the recurrence with a paper lantern procession on the eve, September 7th. 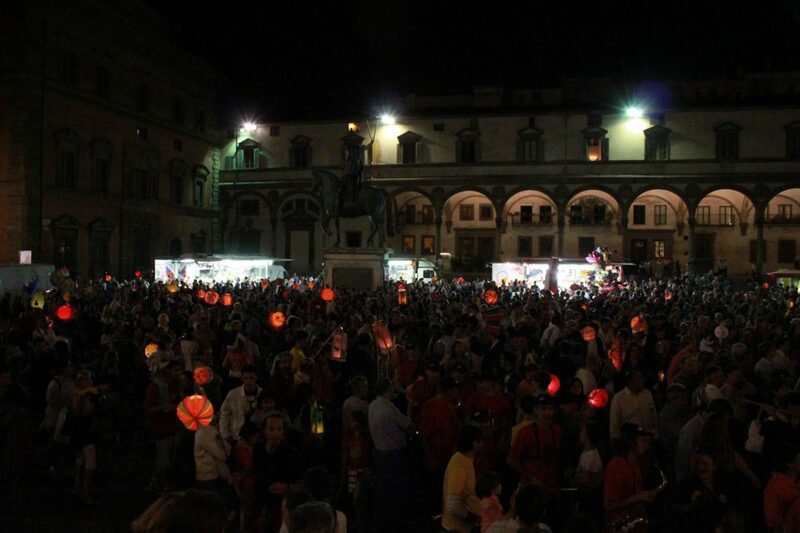 The lanterns are actually a way to recall the many pilgrims that arrived into town the night before with the need of lanterns, but today it is an occasion for small children to first have fun creating their paper lantern, called rificolona, and then join a small procession in town. 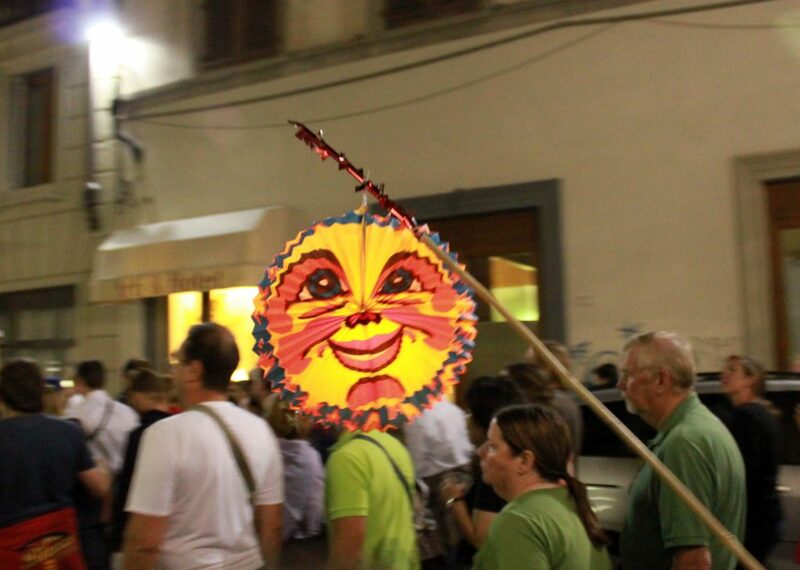 In Florence, the procession can be seen after sundown making its way from Piazza Santa Felicita from around 8pm to Piazza della Signoria, then on to Piazza Duomo (9pm) and then on to Pza della SS Annunziata where there is music and the most “beautiful” rificolona is awarded. 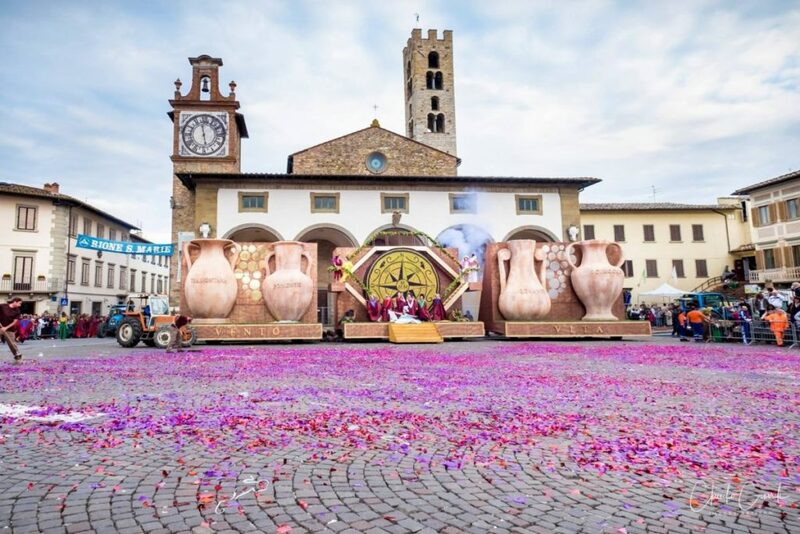 The festival today starts at sun down, when the doors of the Palazzo dei Vicari open and a parade in historical costume streaming out accompanying with the figure of the Vicar departing office to meet the new arriving Vicar to take office as he arrives at Porta Fiorentina. The two parties then return toward Piazza dei Vicari, where games are orgnizaed in honor of the new vicar. 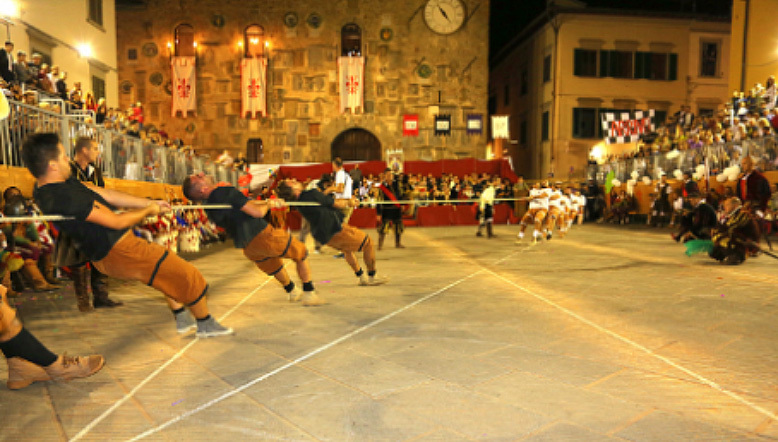 Five different games take place in the piazza between the four “rioni” or areas of town, earning points to win a Palio. Games include knife throwing, tug of war and a type of barrel run. 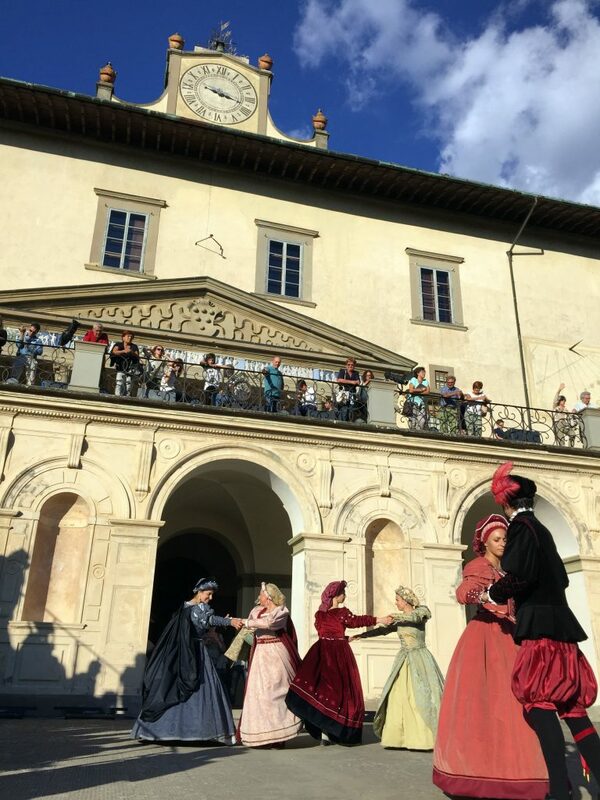 This is another Renaissance fair, taking place over 3 days over the weekend of September 14-16 in the small town surrounding the Medici villa of Poggio a Caiano, about an hour northwest of Florence. The streets have stalls selling many items and showing the trades of the past, from weaving to metal working. They are generally very happy to share what the procedures were in doing anything. It is also the perfect occasion to visit the villa, with its frescoes by Pontormo, and enjoy the falconier showing off his birds, the musicians and street performers entertaining the public. When we went, we enjoyed watching a group of friars playing music and a group of Renaissance couples demonstrating courtly dances. The 2018 edition is organized a bit differently, along concentric time circles around the villa. The villa will host the heart of the Renaissance fair, but as you go out, you will travel toward more modern times, the 17th, 18th and up to the 20th century with a vintage fair. An area is set for the younger crowd called “pianeta giovani” in the more modern area, furthest from the villa. Hours: Friday Sept 14 7pm-1am, Saturday Sept 15 4pm to 2am and Sunday Sept 16 from 4pm to 12am. 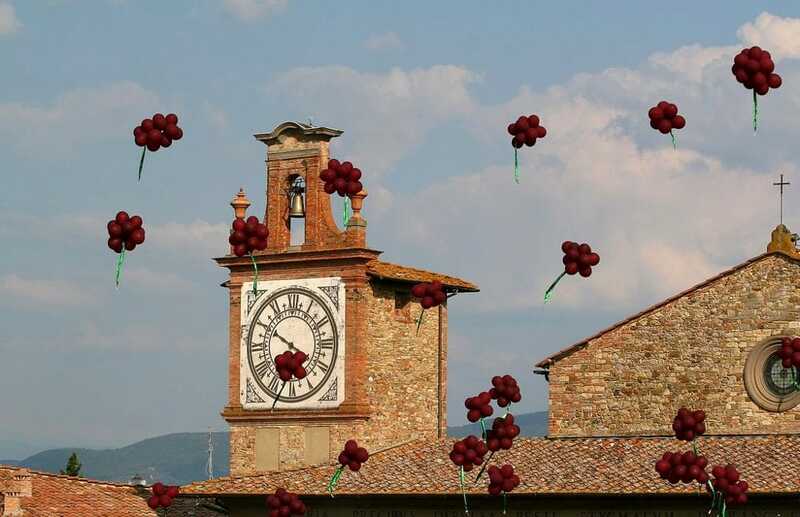 Last but not least, we arrive at the end of the month of September, which in Tuscany is a month of grape harvest for producing lots of great Tuscan wines, with the traditional Grape Festival in Impruneta on the 30th of September. There are other wine events throughout the month taking place in Tuscany (check them out on our September events page) but here I am highlighting this one as it definitely not focused on wine but on the grape harvest, of community coming together to celebrate their origins and main trades. 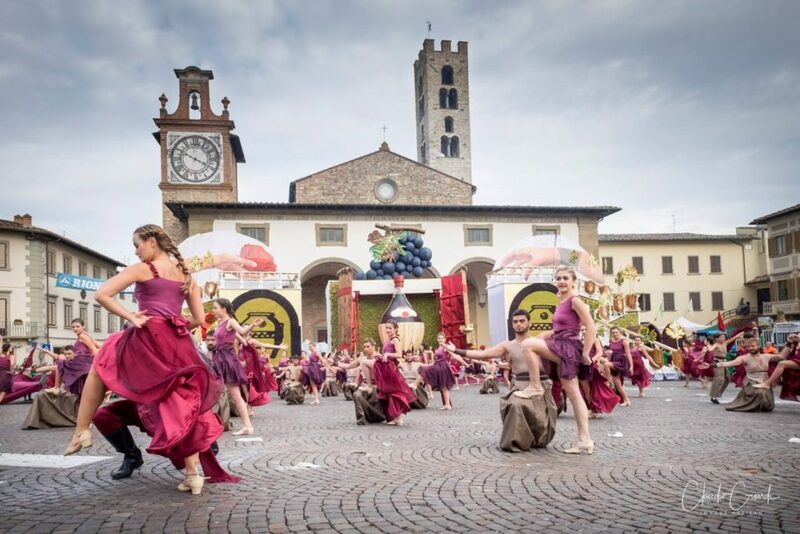 The festival revolves around a grand performance: the town is divided into 4 rioni – Pallò, Sant’Antonio, Sante Marie and Fornaci – and each spends the entire month of September creating a show that takes place in the main square, Piazza Buondelmonti. This includes dance performances, great costumes (all custom-made), large floats which at one time were small wooden carts piled high with grapes to form shapes of wine bottles or urns but with today’s technology and modern tools are now modeled and printed with 3D laser printers. Each rione develops their show around a thematic-project. In over 90 years, the festival has evolved and is most definitely not a revocation of the past, but a celebration of present times. The community of Impruneta remains tied to the land, with wine, terracotta and grain being primary agricultural products, and many local artisans working wood, metal and other materials. 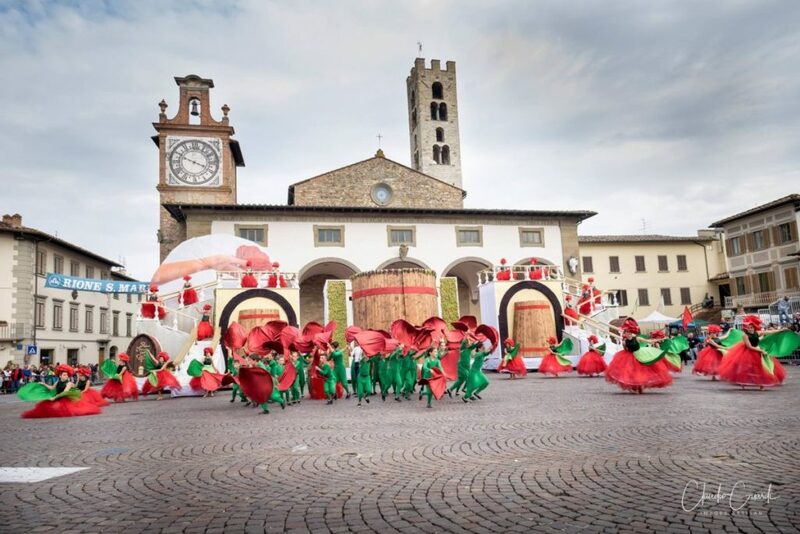 The entire town participates in this very special festival and as a spectactor you will be impressed at the work and dedication they pour into the performances and show. Hours: Sunday Sept 30 from 2:30pm, with main float performaces starting at 3:30pm. Here are a few pics of last year’s performances to give you an idea of what to expext (photo credits Claudio Guardi)! Whatever you choose to do this September, enjoy and share your photos!